The Hundred of Atiscross, in which Hawarden is an important parish, is, in Domesday, included in the county of Chester, and in that Hundred, as in very many parts of the Welsh border, the Saxons, as is well known from history and still evident from the prevailing names of places, early and in strength established themselves. But, although the power of the Earls of Chester and the perfectly Saxonized condition of the peninsula of West Chester gave the invaders a secure hold over the open country on the west bank of the Dee, their sway was contested on the higher and more rugged ground, and though such names as Hope, Northop, Holywell, Whitford, Newmarket, Soughton, and Ryden show that they had settlements in the central and northern parts of Flintshire, the presence of a still larger number of Welsh names show that their occupation was actively contested and the very reverse of secure. The length and severity of the struggle is also made evident by the number and magnitude of the various military earth-works which still attract attention. Such of these as are situated on the summits of hills, are of irregular form, and bear Welsh names, may safely be attributed to the Welsh, while those of Saxon origin, usually on more accessible ground, have a tendency to a circular form, and in some very marked instances are characterized by a central mound, such as is seen at Shrewsbury and Cardiff, and has been removed from Worcester and Hereford. Hawarden, the Haordine of Domesday, and in Welsh called "Penard Halawg," said to mean "the steep head of the marsh," is, as its name declares, a Saxon settlement, and its fortress, so long preserved, presents in a remarkable degree the features of a well-known class of earth-works found both in England and in Normandy. The parish, containing about 16,000 acres, occupies the eastern or English end of the first high ground that rises west of the Dee. It includes the commencement of a wooded ridge, which runs for some way parallel to the estuary, and then trends inland to be lost in the higher country around Northop. The castle stands at the south-west end of a considerable area of level sward, upon which is built the later house of Hawarden, and which, with a deep ravine bounding it on the south and west, is included in the park. The ground occupied by the castle and its earth-works covers an irregular circle of about 150 yards diameter. It rises steeply about 50ft. from the level area, and almost abruptly 150 ft. to 200 ft. from the ravine that protects it on the south, south-east, and west. At the central and highest point of this ground, composed in part of rock and in part of the red sandy soil of the district, has been formed by scarping down, with perhaps some little addition in height, a conical mound, the flat top of which is about 70 ft. diameter, having steep slopes all around. On the north-east side, or that towards the house, the descent is about 30 ft. at which level is a platform occupied by the main ward of the fortress, and beyond it, near the foot of a further but gentle slope, a broad and deep ditch, dry and wholly artificial, which sweeps round this the weakest side, and cuts it off from the area already mentioned. About the other two-thirds of its circumference, towards south and west, the mound descends rapidly to the ravine, but on its way the slope is broken by concentric banks, ditches, and shelves, of somewhat irregular height, depth, and configuration, owing no doubt to their having been originally natural, but converted and strengthened by art. This kind of fortification by mound, bank, and ditch is well known both in England and Normandy, and was in use in the ninth and tenth, and even in the eleventh centuries, before masonry was general. The mound was crowned with a strong circular house of timber, probably constructed like the walls of Greenstead chancel, and such as in the Bayeux tapestry the soldiers are attempting to set on fire. The court below and the banks beyond the ditches were fenced with palisades and defences of that character. The Normans in Normandy, towards the middle of the eleventh century, and in England a little later, and onwards into the reign of Henry II. commonly replaced these defences by more substantial walls of masonry, which, being of great thickness and solidity, have often remained to the present day, though more frequently they were removed in the reigns of the earlier Edwards, to be replaced by structures of more scientific though less solid design, affording more accommodation within the enceinte. At Hawarden the course of action seems to have been different. Here are no traces of Norman work or of the Norman style, and though the keep is unusually substantial, it bears evidence of being the work of one period, and that the close of the reign of Henry III., or early in that of Edward, his Welsh-compelling son. If this be so, it must be concluded that the Norman barons, who were known to have held Hawarden in the twelfth century, were content to allow its defences to be formed of timber, as any masonry by them constructed would scarcely so soon have needed to be removed. The keep (A in the plan) very nearly covers the top of the mound. It is circular, 61 ft. across at the base, and originally about 40 ft. high. The base gathers inwards to a height of 5 ft., where the cylinder is 59 ft. across, and from hence to the summit it further diminishes to 57 ft. The interior is vertical, and 31 ft. diameter throughout; hence the wall, which is 15 ft. thick at the base, and 14 ft. a little above it, is 13 ft. at the level of the rampart walk; dimensions of unusual solidity, even at the Norman period, and rare indeed in England under Henry III. or the Edwards. The exterior is very plain, having neither cordon, nor string course, nor window labels. A little above the ground is a double course of large ashlar blocks of a light yellow sandstone, tying the work firmly together, and higher up are other bonding courses of a less substantial character. The ordinary material is a bluish stone laid as rubble work, with the spaces and joints neatly filled up with spawls and fragments. The battlements have been replaced by a modern wall, but the junction, at the rampart walk, may be readily detected. The entrance is at the ground level on the north-east side, from the main ward. It is marked by a broad flat buttress, rather Norman in character, which rises vertically from the common base so as to stand out about 18 in. where it dies into the wall about 5 ft. below the battlements. In its centre is the gateway, and above, the window of the portculis chamber. It is extended laterally in two wings, rising about half its height, and also dying into the wall above. These are intended to strengthen the wall, weakened by a well-stair and a lodge. As this buttress covers a considerable segment of the circle, and is flat, it is broken into three planes by two vertical angles. The modern brick and stone wall replacing the battlement is rugged and broken, but in parts about 12 ft. high, and intended to give elevation to the keep. The building thus made extensively visible has become a sort of parish cynosure, and however irregular its appearance, it would scarcely be in good taste to remove the addition. The keep has two floors. The lower is cylindrical, 31 ft. in diameter, with walls 14 ft. to 15 ft. thick. It was about 14 ft. high, with a ceiling of logs, which rested upon some forty plain corbels, of which about seventeen remain. At two opposite points, about half way up the wall, are two larger corbels, which evidently supported the struts destined to give stiffness to the central and longest beam. This chamber, no doubt a store-room, save when in time of siege it might accommodate soldiers, was entered direct from the gateway, and rather ventilated than lighted by three equidistant openings, about 4 ft. from the floor, 4 ft. broad, and 5 ft. high, having shouldered heads and within a shouldered covering. The sides converge, and the floor rises to a small square-headed loop of 4 in. opening. There is neither fire-place, seat, nor recess. The floor has been removed. There is no subterranean chamber. The upper chamber within is an octagon, inscribed about the cylinder below, with walls from 13 ft. to 14 ft. thick, and from side to side 31 ft. It is about 15 ft. high to the corbels that carried its flat roof, and a row of larger corbels along one of the remaining faces seems to have supported struts necessary to make the roof a safe platform for military engines and stone ammunition. This, which was a state-room, was lighted by three recesses at irregular distances. They are 6 ft. 6 in. wide, and rise from the floor 8 ft., being covered by slightly-pointed drop arches. Each has a vaulted roof and parallel sides, which afterwards converge upon a square-headed window, 2 ft. wide, and 5 ft. 6 in. high, having a plain chamfer outside. In each side of the recesses is a plain shouldered doorway, 3 ft. 9 in. broad by 10ft. high, opening into the mural gallery. This floor has its main entrance through the portcullis chamber, and next north-west of this entrance is the chapel. This is a mural chamber, 14 ft. by 7 ft., but not quite rectangular. It is flat vaulted, and its axis points south-east to the altar, which is a restoration. The doorway next the west end is only 2 ft. broad by 7 ft. high, with a cinquefoiled head, and a plain moulding of decorated character. The door opened inwards, and could be barred within the chapel. On the same side, but near the altar is a small cinquefoiled recess for piscina, with a projecting bracket and a fluted foot. In the opposite wall, in vaulted recesses, are two windows, that next the altar square-headed, the other lancet-headed. Against the west wall is a stone bench, and above it a rude squint through which any person in the adjacent window recess could see the altar. The entrance to the keep is by a gateway 5 ft wide and 6 ft. 6 in. high, having a drop arch rising about 3 ft. more. The jambs have a single, and the arch a double chamber. Two feet within is the portcullis groove, 4 in. square, and next is the rebate for the door, with its bar holes. Beyond is the vaulted passage, 6 ft. broad, leading to the ground-floor, with a door opening so as to be barred against that chamber; within, however, is a narrow rebate, as though for a lighter door opening inwards. The portcullis grooves are stopped 3 ft. above the floor, so that either the cill must have been obstructively high, or the grate have terminated in a range of long spikes. On each side of the entrance-passage is a shouldered doorway. That on the right, 2 ft. 9 in. broad, opens into a mural lodge, vaulted, 6 ft. by 9 ft., with a lancet loop to the field. On the left the door is 3 ft. 3 in. broad, and opens on a well-stair, which, lighted from the field by loops, ascends to the upper floor and the battlements. Twenty-one steps lead to the portcullis-chamber, which is also the antechamber to the state-room. It is vaulted, 6 ft. broad by 10 ft. long, with a square-headed window of 2 ft. opening to the field, and within it the chase for working the portcullis. At the other end a large doorway with a plain moulding of a decorated type, and an arch very nearly, if not quite, roundheaded, opens in a recess similarly arched, and this into the state-room. The door was barred inside, so as to be held against the stairs. Returning to the well-stair, the upper part of which is broken away, at twenty-nine steps from the base is a small lancet-headed door. It opens into a mural passage, 2 ft. 6 in. broad, and 7 ft. high, which makes two turns at right angles. At one, on the left, is a recess, 3 ft. deep by 1 ft. 9 in. broad, a garde-robe, the back part of which, probably bratticed off, carried a shaft from a similar recess on the ramparts. At its second turn the passage descends seven steps to the nearest window recess in the main chamber, crossing which an opposite doorway leads into the mural gallery. The ascent and descent in the narrow passage is rendered necessary by the level of the steps of the well-stair. The mural gallery, at the main chamber level, is continued within the substance of the wall, to the recess next the chapel. It is in plan a polygon parallel with the inner faces of the wall. It is 10 ft. high and 3 ft. 9 in. wide, having a flagged roof resting on a double tier of corbels, and in it are three large recesses, each opening to the field by a long loop, swallow-tailed at each end. These recesses and loops are not seen from the main chamber. The doors and window eaves, where original, are executed in straw coloured sandstone. The chapel doorway and piscina, and the side doors of the window recesses seem of later decorated work than the rest, and may be insertions, though this does not look probable. Ground Plan, from, a Survey made by Mr. James Harrison of Chester, in 1857. A. The Keep. B. The Main Ward. C. Site of the Hall. D. Offices. E. Entrance; below which is its section. F. Place of the Barbican. curtain, and probably covered over, as traces remain of a second wall. These led to the entrance to the keep, and were the communication between it and the main ward. At the junction of this curtain with the keep is a postern, a small shouldered doorway with a door barred within, whence an enemy who had reached the foot of the keep could be attacked. About 90 ft. lower down are traces of a similar doorway, whence the base of the mound could be reached. Of the south curtain a fragment remains attached to the keep; it had no postern, and probably no steps behind it. 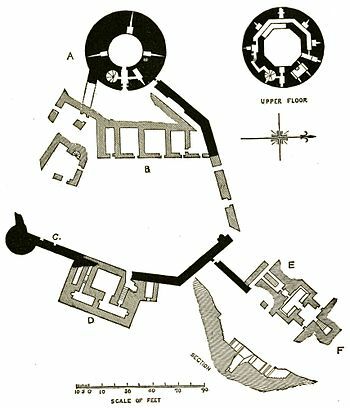 The main ward (B in the plan) is divided into two parts; the one a level platform, in which stood the hall and other buildings, round a court about 12.5 ft. by 92 ft., and into which was the main entrance, and the other, and much smaller part, is the steep slope of the mound, about 50 ft. broad, and which was probably left rugged and useless as we now see it. At the foot of this slope are the remains of four rooms, about 18 ft. deep from the face, probably for stores, each with a doorway to the Court; in the wall of one is a sort of rude drain as from a sink or trough. This range was evidently continued along the south end of the court, being built against the curtain and carried on to the hall. Of these extensions only the excavated ground-floor, some low walls, and the base of a well-stair remain. From the character of the stair it looks as though it had been of some consequence, and it shows that there was an upper floor, probably of rooms communicating with the hall, and perhaps connecting it with the keep. At the opposite, or north end of the store-room range is the doorway at the foot of the stairs leading to the keep, and beyond this, in the curtain wall, a door which seems to have led into a well-stair which gave access to the stepped rampart. Again, a few feet beyond this, at an angle of the enclosure, are the fragments of the great gateway beyond which, for about 100 ft. round the north angle of the court, the curtain is of full height and very perfect, having anglequoins of the same yellow ashlar used in the keep. The hall (C) is placed on the east face of the ward, at its south end, and occupied above one-half of that face. The curtain formed its outer wall and was pierced by its windows, and strengthened at its south-east angle by a solid half-round buttress, 22 ft. diameter, probably an addition. The hall was on the first floor, the low basement being probably a cellar, and entered by a vaulted passage at its south end. The hall was about 30 ft. high from its timber floor to its wall plate. Two lofty windows remain, and traces of a third, and between them are the plain chamfered corbels whence sprung the open roof The window recesses have a low pointed arch and a bold bead moulding. The windows are of one light, trefoiled, with the cusp lights worked. There is no label. Within the recess are lateral seats. North of and connected with the hall, is a rectangular projection (D), 36 ft. deep by 60 ft. in front, the lower floors of which are laid on the scarp of the ditch, considerably below the level of the ward. These were doubtless offices, but as nothing but the lower walls remain, little can be discovered of their detail. There remains, however, in the curtain the jamb of a large doorway, whence descends a flight of steps about 20 ft. probably to a postern, of which, however, there are no traces, on the edge of the ditch. These steps led into one of two apartments, at one end of each of which is what was probably a fire-place, though they more resemble the vent of a garde-robe shaft, which, however, they cannot well be, since the chambers were certainly not cesspools. The walls of this projection are substantial, and certainly carried an upper story, probably occupied by withdrawing-rooms and private apartments attached to the hall. No well has been discovered, nor oven, nor any signs of a garrison chapel, all which were probably placed in this ward. The great gateway opened in the north-west face of the curtain, and from the fragment of a jamb that remains, and the bold rebate, seems to have been about 8 ft. high, and broad in proportion. A projection inwards from the curtain shows that there was some kind of small gatehouse. This gateway opened into a spur work formed by two curtains, 32 ft. apart, projecting from the main curtain down the scarp of the ditch, so as to form a parallelogram 40 ft. wide by 68 ft. long. The curtains are 4 ft. thick and about 24 ft. high. The western indeed is destroyed, but the eastern is tolerably perfect, and at its junction with the main curtain is a shouldered postern door, 2 ft. 9 in. broad, which opened on the scarp of the ditch. At the further and lower end of the spur-work the walls turn inward (E in the plan), and again proceed parallel for 14 ft. at 27 ft. apart, and there contain the gates and pit of the drawbridge, beyond which a second narrowing reduces the distance to 21 ft., at which they proceed for 14 ft. more, when the walls abut upon the counterscarp of the ditch, at that point revetted with ashlar. Thus the whole length of the spur-work, from the main curtain to the counterscarp, is 96 ft., audits breadths, over all, 40 ft., 25 ft., and 21 ft.
About 34 ft. in advance of the great gateway was a cross wall, probably containing a second gate, and beyond it is a flight of fifteen steps, 6 ft. broad, leading down into a rectangular chamber, which has had a flat timber roof, and in the opposite wall of which is a shouldered doorway, without a door, 2 ft. 9 in. broad, and 7 ft. high. This opens into a low, narrow, flat-topped passage, 3 ft. broad and 10 ft. long, but expanded at the centre to 3 ft. 6 in., so that two persons could pass, by squeezing; and at this point, in the roof, is a hole 8 in. square, evidently for the purpose attacking them if necessary. The passage ends in a second small doorway, barred from the inside, which opens upon a bridge-pit, about 27 ft. long right and left, 12 ft. deep, and 10 ft. broad, to a similar doorway opposite. The pit is lined with rubble below the door cills and with ashlar above, and at its west end is a hole, probably for cleaning it out, and communicating with the main ditch, of which the pit is an isolated part. Crossing over a narrow plank bridge, the further door leads through a short narrow passage into a chamber 13 ft. square, entirely of ashlar, and having, right and left, a small door, 2 ft. 9 in. broad, opening upon the counterscarp of the ditch. The doorway from the bridge had no door, but those of the lateral sally-ports opened inwards. In the further, or north wall is another doorway, also shouldered, 3 ft. broad and 8 ft. high, the door of which also opened inwards and disclosed a very steep flight of eleven steps, rising about 8 ft. in a dovetail-shaped chamber, commencing at a breadth of 3 ft. and expanding to 8 ft. It is 14 ft. long. The steps land on a floor, but the walls, of which the lower 6 ft. 6 in., of ashlar, are quite perfect, have so far no openings. This singular chamber is niched into the counterscarp of the ditch, and is actually within the barbican. The remains of the barbican (F) are a considerable knoll of earth, having a ditch of its own, and on its rugged surface showing traces of old buildings. This covers the head of the bridge, and appears to have been approached by a winding road, and entered on the west side. This work has been the subject of much speculation. That it was the main entrance is sufficiently certain. This could only have been at one end of the main ward, and the remaining jamb is too large for a postern, and the ground at the opposite end far too steep for an approach. The spur-work, with its lateral curtains, completely enclosed the entrance. The steps to the bridge are modern, but must represent others somewhat similar. The doors and passage were calculated for single files only, with a special arrangement for commanding the only point at which two armed men could pass. In the chamber beyond the bridge 80 or 100 men could assemble previous to a sally by the lateral doorways. On their return, also, if pursued, and the enemy should re-enter with them, the narrow passages would make almost impossible a surprise or any sudden rush into either the body of the place or the barbican. Further, looking to the lateral space between the walls, and the great length of the bridge-pit, it is pretty clear that above the foot passage was a roadway for wheel carriages, with at least one drawbridge. Most of the passages below seem to have been flagged with stone. One drawbridge was clearly over the remaining pit; another may have covered the chamber at this time occupied by the modern flight of stairs. The thickness (4 ft.) and solidity of the existing walls show that they must have been much higher, so that they would have formed lateral parapets, concealing the passage of the bridge. For this, about 15 ft. might be added to the existing wall. Spur-work enclosing the main entrance. The fan-shaped chamber was probably an outlet for those who, having used the foot bridge, did not wish to go out by the sally ports, but to ascend into the barbican. The steps are no doubt inconvenient, but the whole passage was certainly only meant for occasional use, and is in no part particularly commodious. Probably the means of egress from the stair-head into the barbican were stairs of timber. The whole arrangement is very peculiar, and it may be doubted whether the safety proposed was worth the considerable expense bestowed upon it. As the whole of this bridge arrangement is clearly an addition, it is probable that though the original entrance was at this point, it was by an ordinary drawbridge, of which the lateral curtains of the spur-work, which are old, would be the protection. Of the exterior earthworks there is little to be said. On the south-east side of the fortress the outer bank is cut through, as though for an entrance. If so, this must have been carried laterally along the ditches of the place until it reached the barbican. Hawarden seems to present traces of at least three periods of construction, the oldest being that of the works, which, like some similar ones in England, may be as early as the tenth century. The keep, the curtain of the main ward, the hall, and perhaps the curtains of the spur seem to be of one date, the material employed being substantially the same, and the workmanship not unlike. The range of storehouses in the main ward, the offices projecting from it towards the north-east, and the whole of the buildings of the foot entrance are of later date, and of different design, material, and workmanship. The material is a greenish sandstone, and the workmanship ashlar of the most expensive kind, dressed on every face, and laid in thin joints, with but little mortar. This excellence has proved fatal to the structure; for as the stones needed only to be lifted from their beds and laid, without any adaptation, into any new work, the temptation has proved too strong, and most of this later work has been carefully removed by hand, and not, like the older work, overthrown by gunpowder. In fact the lower walls that remain have much more the appearance of an unfinished than of a partially destroyed building. There is a paper by the late Mr. Hartshorne in the fifteenth volume of the Archæological Journal, which, though it touches but lightly upon the topography of the castle, enters at some length upon the history of the Barons of Montalt, long its owners. From thence, and from other sources, it appears that Hawarden belonged, from a very early period, to the Earls of Chester, some of whom probably constructed it, and no doubt occupied it after the Saxon fashion. In their line it remained till the death of Ranulph de Blundeville, the last earl, in 1231, when, with Castle Rising and the "Earl's Half," in Coventry, it came to his second sister and co-heir, Mabel, who married William d'Albini, third Earl of Arundel. Their second son, Hugh, who inherited, died in 1243, when the estates passed to his second sister and co-heir, Cecilia, who married Robert de Montalt. The Barons de Monte-Alto, sometimes styled de Moaldis or Mouhaut (Mold, where the mound of the castle remains), were hereditary seneschals of Chester and lords of Mold. Roger de Montalt, grandson of Robert and Cecilia, inherited Hawarden, Coventry, and Castle Rising. He married Julian, daughter of Roger de Clifford, justice of North Wales, but dying childless, in 1297, his lands passed to his brother Robert, the seventh and last lord, who died childless, 1329, when the barony became extinct. Robert de Montalt signed the celebrated letter to the pope in 1300, as Dominus de Hawardyn. [P. Writs, I. 743.] He bequeathed his estates to Isabella, the queen of Edward II. In the Inquisitions and Escheats are also some entries. From an inquisition, 3 Ed. I. Robert de Monte Alto is seised of the manor of Hawardine, co. Cest. His possessions were extensive. They occupy 91 entries in 13 counties. [Inq. p.m. I. 55.] In the next year, 4 Ed. I., is an inquisition, whence it appears that the manor was never settled in dower. Neither Leuca, wife of Robt. de Montalt the Black, nor Matilda, wife of Ralph de M., nor Nicholaa, wife of Roger de M. the elder, nor Cecilia, wife of Roger the younger — all ladies of the Honour of Hawirdyn — were ever so endowed. [lb. 60, Cal. Geneal. I. 247.] 10 Ed. I. 25 March, is an entry on the Welsh roll concerning the pursuing and taking certain Welsh malefactors, who took captive Roger de Clifford in the king's castles of Hawardin and Flint [Ayloffe, p. 76], and from the king's writ itself of that date, addressed to Roger de Mortimer, and given at length by Mr. Hartshorne, it appears that the Welsh attacked Hawarden by night, killed some of de Cliflford's household, and burnt the castle houses, and did much the same at Flint. This outrage was repeated in the next year, when (6 Nov. 1282) the justice's elder son, also Roger Clifford, was slain. [Foss' Judges, III. 76.] The next entry in the inquisition is one of 25 Ed. I. on Roger de Montalt, whence it appears that at that time, though he held Castle Rising, &c., the manor of Hauwerthyn was vested in Thomas de Offeleye. This might, however, be as feoffee in trust. [Inq. p.m. I. 134.] From all this it may be inferred that there was a castle here which Prince Llewelyn destroyed, and which Robert de Montalt undertook not to rebuild. Such promises went for as little then as between nations at the present day, and the castle that the Welsh took 10 Ed. II. 1282, was of course built or restored during that period. If Llewelyn had found a keep of anything at all approaching in substance to the present he could scarcely have destroyed it; nor does it seem probable, from the internal evidence of the building, that the keep now standing was the work taken by the Welsh, 10 Ed. I. Its mouldings and the plan of its upper floor point to a rather later date; and probably it was the work of the last Baron de Montalt, between 1297 and 1329. Cylindrical keep towers, of a pattern not unlike that of Hawarden, though usually, as at Courcy, on a much larger scale, were in use in France in the earlier part of the thirteenth century; and although the unusual thickness of the walls in the present example might be thought more in keeping with the Norman period, the general details, the polygonal mural gallery and interior, and the entrance, evidently parts of the original work, are very decidedly Edwardian. Hawarden was finally dismantled by order of parliament, in the time of the Commonwealth, and the keep much shattered by a mine, sprung probably under the doorway. It so remained until very recently, when it was restored by Sir Stephen Glynne, the present owner, under the advice of Mr. Shaw, of Chester. The task was one of exceeding delicacy, but it has been executed with marvellous skill and complete success, so far as the work has proceeded. Enough remained of each part to give a clue for its reproduction, and thus the gateway, portcullis chamber, much of the well staircase, most of the chapel, and part of the great mural gallery have been restored just as they must have been left by the original builder. At the same time the stone employed and the mode of dressing it, will always indicate to the skilled observer which parts of the work have been replaced. The present access to the rampart is an addition in brick of the last century, and will probably in due time be removed. The view thence is extensive, having in the foreground the park, which for wildness and sylvan beauty may well compare with any ground even on the Welsh border; and beyond is the broad and fertile plain of Cheshire and Shropshire, including the city of Chester, the rock and ridge of Beeston, and, in clear weather, the Wrekin. In the opposite direction are views, less extensive, of the estuary of the Dee and the peninsula of West Chester. The Welsh view is inconsiderable, being cut off by the higher ground. It is laid to the charge of Sir John Glynne, that he made free with the materials of the castle, and so provided an ample field for antiquarian speculation. Even, however, though this be so, it must be admitted that his descendant has done his best to atone for the spoliation. No ruin in the kingdom is more carefully preserved, or situated to more advantage; the spreading oaks and fantastic beeches that rise from its velvet slopes beautify without concealing the structure, and when circumstances require their removal, they fall before the axe of no unskilled or vulgar woodman.